Operations continue aboard the JR. These drilling operations require the JOIDES can maintain a fixed position, which may seem a difficult task against the winds and currents. This ship has many unique technological equipment that allow it to master his position. Twelve thrusters equip the ship. These engines provide the ongoing repositioning of the ship despite the wind and currents. The boat position is defined by a precise GPS position (by satellite) and also a beacon placed on the seafloor (beacon’s signal is recorded by sensors under the boat. JR remains stationary position during shipping. Will it the same with our buoy ‘Dryfty’? 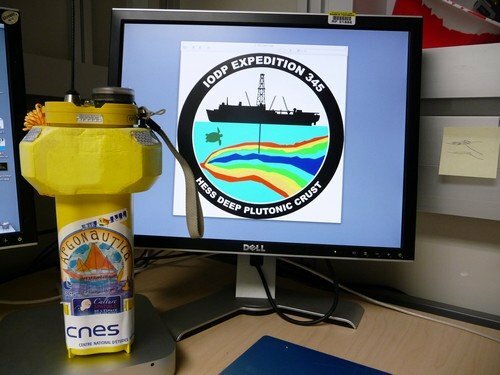 ARGOS buoy (the educational program ‘Argonautica’ CNES) was given to me for launch into the waters of the Pacific Ocean at the Hess Deep Rift. This buoy, responds to the nickname of ‘Drifty’, will float in relation with the wind and the currents. Two questions this week for a single enigma : in which direction and at what speed should sail away ‘Drifty, the JOIDES which remain in a fixed position. Where will be Drifty for Eve of New Year ?